You'll be £25.00 closer to your next £10.00 credit when you purchase The Last Cruise of a German Raider. What's this? Order within the next 18 minutes to get your order processed the next working day! But the book is much more than the account of one naval battle. The Emden’s activities as a raider at the beginning of the war are outlined; the significance of the departure of the first ANZAC troop convoy, and Sydney’s involvement explained. The Cocos raid and the landing of von Mücke’s party and the dispatch of Sydney to investigate are covered, and Captain Glossop’s controversial decision to open fire on the wreck of the Emden is analysed. And drawing on the reports produced by Sydney’s surgeons, the book presents a facet of naval action often overlooked – namely the effect of high explosive shells on the human body. Employing the wealth of archival and photographic material, as well as the numerous first-hand accounts of the German, British and Australian participants, the author has written a work that takes the reader right to the centre of the action and brings alive the immediacy and horror of naval warfare for those who took part. This book however is a shining example of what a history book should be: with an index, a bibliography and with the text heavily referenced to primary sources such as the AWM archives and survivor accounts. It is well written with no obvious editing issues. A thoroughly absorbing and recommended read. The author’s extensive use of archival and photographic material coupled to numerous first-hand accounts of the German, British and Australian participants has resulted in a volume that takes the reader to the heart of the action while at the same time bringing alive the immediacy and horror of naval warfare for participants. 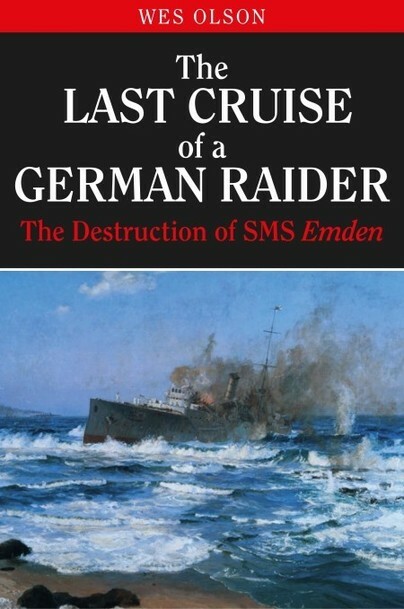 This is by far the best English-language account of the life and death of the German cruiser EMDEN and is highly recommended. A great read, well produced. The Author, Wes Olsen can be congratulated on achieving a remarkable publication that includes: a Glossary of German Naval/Royal Naval rank and ratings equivalents; complete crew lists; and Appendices providing a complete source record that Wes has woven into this unique publication. Finally after 104 years the definitive history of the action between HMAS Sydney and SMS Emden has been written. The first known published account of the action, in a book, appeared in July 1918 as a chapter titled ‘How the Sydney met the Emden’ in Bennet Copplestone’s The Secret of the Navy. Over the next one hundred years several books on the action have appeared regularly; ranging from the quite good (such as Mike Carlton’s First Victory 1914 – HMAS Sydney’s Hunt for the German Raider Emden published in 2014) through to the barely readable and often incorrect Guns in Paradise – The Saga of the cruiser Emden by Fred McClement published in 1968. Wes Olson has done an outstanding job is detailing Emden’s history from her construction during 1906-1908 to her final action with HMAS Sydney on 9 November 1914 off the Cocos Islands. The final action is dealt with in great depth with several first hand recollections from both sides – but the story does not end there. Wes details the extensive activity to recover Emden survivors and the subsequent medical work done by both RAN and German medical staff to keep the numerous badly wounded and dehydrated men alive. Emden’s landing party under Kapitanleutnant Helmuth von Mucke and their epic journey in the schooner Ayesha to the neutral Dutch East Indies and then via steamer, to the Red Sea, and afterwards overland to Constantinople also receives a lengthy analysis. The story of the wreck of Emden finalises the history of this famous ship. Several of her guns were recovered and, along with other artefacts, brought to Australia for display with many still visible today in Sydney and Canberra. In a little known event, in 1933, the Australian Government returned Emden’s name plate to Germany and it was formally presented to the German President Paul von Hindenburg in recognition of the bravery of Emden’s ships company and the chivalry of her commanding officer Karl von Muller. If you want to read the complete history of the Sydney – Emden action then this is it! A very readable and well illustrated book spanning 274 pages. Unlike earlier authors writing on the subject, it is clearly evident that Wes has thoroughly researched the current book to provide Emden's total story for every reader. WES OLSON has had a lifetime’s interest in naval history and was involved in the successful 2008 search for WWII cruiser HMAS Sydney and the 2015 expedition which revisited her wreck and that of HSK Kormoran. He is an Honorary Associate of the Western Australian Museum, and a member of the Naval Historical Society of Australia while his first book, Bitter Victory – The death of HMAS Sydney, was published by University of Western Australia Press in 2000. Other works since then include Gallipoli – The Western Australian Story (2006), Battalion into Battle – The History of the 2/11th Australian Infantry Battalion 1939-45 (2011), and HMAS Sydney (II) – In Peace and War (2016). Married with three children, he is employed as a locomotive driver with Pacific National.